A few months ago, on my Making Roti post (where I promised a longer and as yet unrealised musing about roti) Cynthia had asked about the differences if any, in making the dough for the different types of roti. Mom was supposed to answer this, and as she is here, I got her to sit down and discuss the differences in the dough or loy. We make about 4 different types of roti in Trinidad; possibly the same or similar in Guyana. And when I say “roti” I mean what is also called in Trinidad, the roti “skin“, as “a roti” has also come to mean the dhalpuri roti wrapped around a curry filling. Therefore the “skin” is the dhalpuri. Which is also a type of roti. We confusing ent? Reach Guyana now, and “roti” is something that looks like Trini paratha, and cooked very similarly, but not bussed-up. 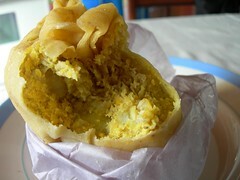 Trini dhalpuri is called very simply “puri” in Guyana and I have heard Guyanese say that puri is not roti, puri is puri. Roti is the paratha. But we both have sada roti. Not sure about dosti. But onto the post, wherein perhaps there is greater clarification. Or greater confusion depending on your particular experience. But all in the name of food! The entry also describes the types of roti made in the West Indies, although, they omit the Barbados roti. And they call fry bake a type of roti. Hmm. That’s deep fried. But we’ll get to that. Roti (whatever the variety) in Trinidad, and Guyana refers to a flatbread cooked on a tawah (flat cast-iron or iron round plate). Whatever its origins, I don’t think any of us in the region think of roti as anything else. Which means deep fried bakes – NOT roti. Bakes (really baked, in ovens) – NOT roti. Except that people do make tawah bake. Different from roti because no sakaying (brushing with oil) and it wouldn’t swell. Breads made like this may be considered roti in other countries, but we have a different picture in our minds and a different vocabulary. And as I said before, we only have a few types of roti. Dhalpuri is a filled roti – stuffed with ground cooked dhal (yellow split-peas) which has been seasoned with geera/cumin, garlic, pepper etc. The dough is made out of flour (wheat), baking powder, salt and water. We use about 1 teaspoon of baking powder per cup of flour, and knead lightly. You want the dough or loy to be a little elastic, but still soft and pliable. Mom also puts a litle oil over the dough after mixing and kneading to keep it soft. After filling little balls of dough, you have to carefully roll the balls out thinly without bursting it. You don’t want it too fragile or the dhal will poke through and burst the roti. This is then cooked on a tawah, brushing each side lightly with oil (sakaying). It should puff a little as it cooks, as the air inside the filled layer heats up. 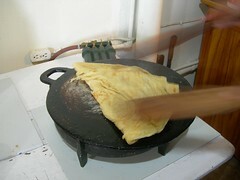 This is the roti that is used in Trinidad to wrap around fillings of curried meat and vegetables, with potato in Trinidad. In Guyana, the “puri” is usually served with a dash of “sour” or chutney in the middle, then folded up. Many roti places in Barbados may be run by Trinis or Guyanese and these will resemble the wrapped dhalpuri roti. But I notice Chefette’s has always sold a “roti” with a roti skin that is not filled and in some cases tastes just like a thin tortilla. But the curry isn’t bad, even if they sell rotis WITHOUT potato. Sigh. A wrapped roti in my mind, starts with the dhalpuri, put the potato THEN other fillings. To each his own. I mean, I think dhalpuri is excellent toasted, or eaten with eggs. I have posted a recipe for paratha or buss-up-shut. It is flaky, rich and layered and not quite the paratha known through most of the world. Making paratha is a multi-step process, involving making the dough, making the layers with oil/ghee/butter, rolling out flat and thin then cooking on a tawah while brushing with oil (sakaying). Then comes the bussing of the roti to make the layers separate and get flakier. Because a good paratha should be light and flaky, it’s a good idea to think of it as pastry rather than bread. So the dough is made with flour, baking powder and salt, just like dhalpuri, but very light on the baking powder – about 1/3 teaspoon per cup of flour. And don’t knead very much and let it rest and relax between each step. You don’t want to exercise that gluten too much – it’ll become too elastic and tough and when it cooks it may be very stiff, rather than light and flaky. If this happens by accident, you have to let it rest a LOT, preferably in a refrigerator overnight. In fact, that’s not a bad idea anyway, to let paratha loys relax and chill. Think pastry remember. And cook on medium high heat. Too much browning too fast won’t help the layers come apart in the right way. In Guyana I believe the preparation of the dough for paratha is very similar, except they clap the roti to make it separate a bit, but not flake away into layers. Sada roti is home food. The kind of food I grew up eating at home, but didn’t really want to take it to school where everyone had sliced white bread. I clearly had typical wanting-to-fit-in issues in primary school. I didn’t like to take hops bread sandwiches either, but that’s different. I don’t think hops bread is as palatable when eaten in a sandwich that has been in a lunch box or bag for half a day. It needs to be hot or toasted to get the crustiness right. Anyway, back to sada. It is made from a simple dough of flour, salt, baking powder (1 tsp per cup of flour) and water. Some people may use yeast, but I don’t (Mom does – she says a pinch of yeast keeps it nice and soft). You can knead this more than other roti doughs, but you still should let it rest to ensure that it will swell nicely when cooked. When both sides are just cooked, you put it over an open flame and very quickly turn it round and round, so it gets even heat and does not burn. This heat will (if you made it right) make the roti swell all the way through until it’s almost round. Then when you cut it into quarters, it makes it easy to put things inside. It’s supposed to be a quick to make flat bread/roti and was commonly made every day in some homes and eaten with various vegetable chokas. In our house we liked butter, and especially when you get it hot off the tawah, and you put cheese in it so it melts…mmm. It’s been quite a long time since this joys of the sada roti have spread far and wide in Trinidad and Tobago so that it is now a regular breakfast menu item where local food is served. Apparently people used to also make sada roti with coconut milk instead. This they ate with buljol. Also, the basic recipe for sada roti can be used for fry bakes with success. Dosti roti is made from a dough similar to dhalpuri in terms of the amount of baking powder etc. However, this roti is essentially a layered (although not bussed up) roti. When you make the dough, you break it off into balls and flatten them a bit. One one side of each flattened round, you spread butter/oil then sprinkle a bit of flour. Press the oiled sides together, then roll out thinly. When cooked on the tawah, the dosti will be able to separate into two thin rotis. This can be made with more than two layers, which allows for even thinner rotis. While dostis can be used as regular roti, eaten with curry etc, it is also commonly used to make the wrapping for samosas. According to Wikipedia, dosti is not made in Guyana. Any confirmation? Edit: Cynthia (of Tastes Like Home) has confirmed that her mother used to make dosti in Guyana and is pretty sure, at least in country areas it is indeed made in that country. The rotis listed above are the more common ones that most people may know about in the Caribbean (or at least in T&T, Guyana and Suriname). However, I did grow up wth some variations which my mother will insist I include here. Aloo Roti – this is like a dhalpuri, but filled with mashed potato, seasoned with geera/cumin, pepper etc. It may be similar to the parathas the rest of the world knows. Sugar Roti – yes, sugar roti. Mom grew up with sugar roti and has made it for us a couple times. It’s sada roti, filled with sugar. Her grandmother used to make it for her when she came home from school lunchtime. Apparently Mom didn’t eat what her grandmother cooked (the things you can learn when you question falling-asleep people – it’s like the time she finally admitted that after decades of telling us that she had a great first pregnancy, that labour was the longest and worst). Her grandmother would cook it on the chulha and it would get brown and when you cut into it the sugar oozed out. Coconut Roti – like sugar roti, but filled with coconut and spices (“googia“). And then there was a thing her mother apparently called Egg Roti, which Mom says was really like a pancake, with nutmeg and cinnamon etc. And that’s my roti musings. I think there are other things I could say, but some of it requires research beyond my personal knowledge. I really would love to know about other people’s roti experiences, since judging by my family, there are variations that aren’t common in the public knowledge. This entry was written by Chennette and posted on April 8, 2007 at 3:23 pm and filed under Caribbean, food, Guyana. Bookmark the permalink. Follow any comments here with the RSS feed for this post. Post a comment or leave a trackback: Trackback URL. I never had this sugar roti. Aha, finally, the roti mystery unravelled. Thanks for the long, educative post. I’ll try the dhal puri dough with the tsp of baking powder to 1 cup flour ratio. The other question that I remembered mentioned in your musings was whether or not the dhall puri should have “brown spots” or not. What did your mom say? The ratio you described for the paratha is the same I use. I think that the mistake most people make when they complain about their parathas not coming out flaky is not allowing the dough to rest enough. Paratha was one of the first things I learnt to make as a child. As to the dosti roti, I do not think that it is widely made in Guyana but I know that my mom makes it and I’m sure there are households that make it, especially in the country areas. The egg roti your mom mentioned sounds very familiar only mommy calls it cho-tah. It is indeed made like pancakes. As a child I never liked it and mom used to make it often as it was so quick and easy. Now as an adult I make it every now and then as I like it with the butter melting into it and a nice cup of tea – hmmmm another thing to put in the column. See how many similarities we have in roti Cynthia. Perhaps as we look at other foods we my yet see more in Chennette’s Blog, God Willing. My Mom use to say that Dosti got its name becaue two rotis were cooked together like two friends; Dost is the urdu word for friend, perhaps some of you may remember an Indian Film which won many awards by the name of DOSTI. It was the story of two friends. Strange that Lilandra never tasted sugar roti, she probably took one look at it and did not like it and blocked it out of her memory, hehehehe. Was Dosti (the movie) with Dharmendra and Amitabh Bhachan? No they were not in that film which was in 1964. See below what I got online . Dosti (Hindi: ????? ?, Urdu: ?????) is a 1964 Indian Hindi film directed by Satyen Bose and produced by Tarachand Barjatya ( of Rajshree productions). The music is by Laxmikant Pyarelal. The film was Sanjay Khan’s breakthrough film and also had Sudhir Kumar, Sushil Kumar , Leela Mishra and Leela Chitnis. The film focuses on the friendship between two boys, one blind and the other a cripple. Hi Cynthia, thanks for your comments. I have realised that when we discuss country practices in T&T and Guyana, we do have a lot of things in common! Like a friend of mine in Guyana who was saying she never knew this doubles bara – she grew up with a substantial bara you eat by itself. Which I did too. Doubles bara was an innovation! And as for brown spots on the dhalpuri – Mom doesn’t really like them. That’s why we toast it afterwards 😉 She likes dhalpuri to be silky and evenly light-coloured. Which is how the best commercial roti is made, she’s right! Truth is, if you do put brown spots on it, eat it when hot because I think it may be a little stiff when cooled. well, at least there’ll be some rationale for it, as opposed to the people who search for Xamaycan (country name amended) doubles, as if there’s such a thing! @ Chennette – The next time I make dhal puri I want to make them without the brown spots – I think (silly perhaps) that that is a mark of a skilful dhal puri maker Although, I don’t mind the brown spots but as you say, eat it while it is hot or else… Does your mom have any advice on not getting brown spots? I think it is all heat regulated isn’t it? Oh and perhaps on how thinly the dough is rolled? Cynthia – thin and even rolling, so it cooks evenly without any bits browning. Which is why I never got to roll out the dhalpuri. I had tawah duty because I used to roll out great squares. Probably uneven too. And I think yes, not too high on the heat. Thanks. Will ensure that I take some pics when I do so I’ll share them with you. Chennette, with reference to you not wanting to take sada roti to school, my thing was bake. I never wanted to take bake to school, be it coconut, ow white and much less whole wheat bread. Since Sunday morning was usually coconut bake to go with the cocoa tea, Monday’s lunch was inevitably the remainders of that bake. I used to have to try to coerce my mother into cutting off all the crust so it will look like regular bread….as if any of the other students cared that I ate bake for lunch. making you stretch your mouth too wide to bite? pray tell us, where’s the inhumanity? Bake can’t fit in my poor mouth. I have some roti-making pictures to share…. A very informative post Chenette, and a great read. You’ve certainly taught me a thing or two about roti. Hi Trig and welcome. Just remember that it’s roti from a Caribbean perspective Although it would be great to go on some kind of food tour of India, Malaysia etc where they have all different types of roti. Over the last month or so, I have had an eager desire to have some roti – any kind of roti – and you have definitely inflamed that urging. I just happened onto your blog and I am glad I did. I am actually considering learning to make roti myself so I could put together some whenever the feeling hits me. I really enjoyed reading your blog entries. Keep up the wonderful work. Hi I N – welcome. And good luck trying out roti – So far I have a paratha recipe on the blog, maybe more soon. Making roti can by fun to try out. Even if it doesn’t come out so good, just toast it till it’s brown and crispy (works for both dhalpuri and paratha) and voila yummy crispy bread with roti origins! the thing about roti is that no matter where you go in the world there is nothing like roti made in Trinidad and Tobago.The Great taste of a Dalpuri and Duck or Paratha and any side dish or Sada and any talkari is the true taste of T &T.
I hate to sound very uneducated about roti…but frankly all this talk about roti makes me thing of one thing eating the stuff. So yet again you’ve succeeded in making me hungry while making me think vaguely of trying to make some of this roti stuff and then deciding that what I need to do is come and spend some time attached to your kitchen/regular eating haunts and fulfill this emptiness left from reading interesting blogs about roti…. Rone was last seen torturing herself by going through cookbooks while muttering the words, why couldn’t they have transferred her here?? Rone, how come you did not learn to make roti from Chennette and Hmmm when you were studying and living in the same apartment building……. Not good at all (smile). Anyway you can always come spend some time with us to get the hang of roti making. Or you can go visit our trini friends in Spanish Town where we can arrange for you to get some lessons. I have to confess that neither Hmmm nor Chennette really focused on teaching us how to make roti, I am informed by a little birdie that Hmmm did not have the requisite skill at that time, I have no comment on that. There was however another of your compatriots who hailed from Point Fortin, did teach us how to make paratha…alas none of us were brave enough to attempt dahl phouri. Well, Rone. Hmmm and I never made roti by ourselves before Barbados – at least paratha, so we were teaching ourselves together whenever we tried making it. Your little birdie friend wants to get me in trouble with Hmmm. She had the rolling skills for the paratha loy and we worked on the dough and cooking together. As for dhalpuri. I need a food processor to even consider trying. But in any event at home it was always a production line food item. I will give the little birdie the message or should i call her the little bear…anyway, I take you will explain who was from Point Fortin to Lilandra…I don’t think she met Point Fortin Girl…I’m sure dhal phuri is a production line process…thinking of breaking out the tawah (sp) again soon. 1. Get a cookie tin, you know one of those cylindrical metal tins with a cover – average size. 2. 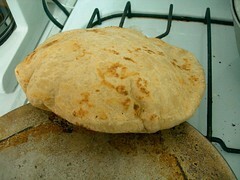 Move roti when it is finished baking from tawa directly to the tin. 4. Hold down the cover with one hand and the bottom of the tin with the other hand. Wrap the tin in a towel or hold it with a pot holder, since it gets very hot. 5. Shake the tin in an “up and down” motion and a “left to right” motion about 10 times each. 6. Open tin, take out roti and fold or wrap in whatever manner you normally keep your roti. NOTE: Be careful about how many times you shake the tin. Depending on the texture of your roti, it could literally disintegrate if you have made a very soft roti and shake it too vigorously. Enjoy substituting Shaking for Clapping Roti. This way you could make hundreds of roti in a shorter period of time and needless to say the tiredness you feel in your hands after you are done disappears!!!! I have also found that a non-stick flat griddle or pancake pan makes my roti better than a tawa!! I love your website it is very informative and fun at the same time. Hello and Welcome Hazel. Thanks for the tip! I use dabblahs to flake the partha roti however my Mom use to clap and she used the dabblahs for the very big roti like 20 to 30 inches size. However I have seen the tin or a container with a cover used in Guyana. And the result was good. But when one uses the same dabblahs for turning etc then it is easy to use this for flaking or beating. Mmmm…can you post a recipe for googia and the sugar roti please. They sound delicious and I love roti with a passion. Also, have u ever heard of a dosa roti(made with rice). I read that it was once a common roti. My grandma told me about a roti her aunts used to make; it was like dal puri, but with a green pea/pigeon pea filling instead of the split peas. The skin of the pigeon peas would be removed and then gound and seasoned with geera and other spices. It was made in the same manner as dal puri. Hi Marilyn and welcome. I will work on those recipes (with Mom) and post soon. And I think I have had pigeon peas dhalpuri – Mom also made pigeon peas dhal which was actually in my mind this week to do a post on dhal! Peas puri it is called and it is made just like dhalpuri. The pigeon peas are boiled, just like the split peas with salt and saffron and when soft, drained and ground ; it is then seasoned in the same manner as the split peas. Method for making peaspuri is the same as for making dhalpuri roti. Always made it whenever peas is in season. Not so often nowadays though. Another name for the egg roti is sweet dosa and it is a South Indian roti made from a batter and cooked on a hot tarwah. The mixture is poured on the Tarwah in a circular motion. The flour used to make the roti can be varied and when ground rice is used instead of wheat then we have a rice dosa or a plain dosa. Long ago in Trinidad we had rice being planted and so it was milled and used in many foods instead of wheat flour. Nice thin wafer like roti or plain dosa. Would work on the recipes with Chennette soon………. is this the one you say like pancake? Yes and the sugar roti is like a puri but filled with sugar and the googia is like an aloo pie but filled with a sweet flavoured coconut filling instead. Yes goolgoolah it is called for the dosa made with bananas. Ah know ah kinda late on d scene but how come none ah allyuh never talk bout ital roti? Like ah did say, ‘like this blog is ah culinary version of…’ eh ehm. Anyways, but fuh real Chennette gurl meh bredda was telling meh yesterday in the promenade he sample ah ital roti from d rasta next to the KFC and he say it dread fuh years. He even say if he coulda fedex it ah woulda real like mehself. And d interesting thing he say it not only it have no meat; but no curry! Imagine that no curry in ah roti. And d roti (ah doh know which one ah dem yuh call it cause is so much type ah skin; parata?) is from wholewheat? Seeing that yuh is ah original Trini culinary connoisseur what yuh think bout dah flick? Are you talking about Sada (plain) roti as this can be made as all roti using wholewheat flour as well. But a sada roti ( usually sold in quarters) since introduced as a breakfast item on sale in Trinidad has always been served with a choka made with roasted tomatoes or baigan and well seasoned and mixed with burnt garlic , onions and peppers in oil, sometimes pumpkin or fried aloo(potatoes) or whatever is the breakfast dish one likes…..salted fish and avocado or smoked herrings and tomatoes choka can also be added to the quarter sada roti…. and these things are made with no curry…. Honestly I have no clue how d ras make he roti bake. As that what we used to call it when ever they served us that at the IMG camps and it was like you said kinda square always served with some kinda of choka. As this was new to me as I never had that type of ‘bake’ nor the tomato ‘choka’. Actually I was thinking that people choke from it that is why they call it ‘choka’ until i saw is more water than anything else. But what I can say I have had before is ital doubles (I think that is an pure original Laventille flick with wholewheat bara. Ever heard of that? AAAAAAAAAAAAAAAAAHHHHHHHHHHHHHHHHHHHHHHHHHHHHHHH! Did you see? IMG camps! Aye how come yuh doh have a section yuh could see d lastest comments, regardless of when you posted d article like on other blogs? I was trying to be minimalist in my blog design, and keep the columns at the right thin…since my designer has ignored my for 9 months now, I suppose I can clutter it up upon request. Thanks for dropping by my blog. I was going to come over and leave a comment that I had linked my Dhal puri post to this post of yours. since we don’t use the word phulka, the relative rudeness doesn’t arise 😀 no worries. This looks fantastic, thanks for the instructions. I will make one on my sister’s next birthday party. Hi Samantha – dhalpuri is a soft roti, but it is a filled roti, unlike the Chefette roti skins which are just a single layer (from what I recall, haven’t had one in a couple years). The dhalpuri has ground split peas between 2 layers, but if made well and not browned, it will be soft. This is the roti that is used for Trinidad rotis, where the whole wrapping a roti (skin) around curry originated. Keeping the rotis stacked and covered right after cooking helps keep them soft and pliable, even if over-cooked.